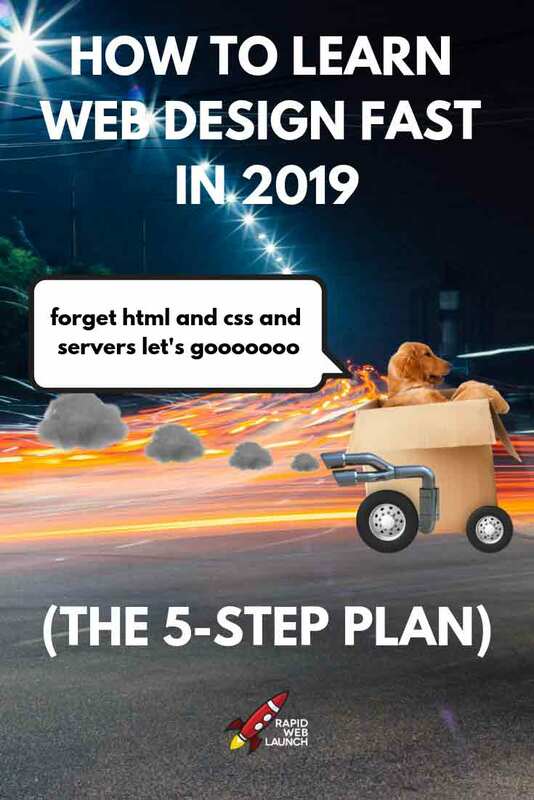 Learning web design in 2019 is simpler and faster than ever. That doesn’t mean it won’t take a lot of work. It just means that it’s a lot easier than it used to be. Every other web design blog will tell you to do things like learn coding, programming and server management. Or they’ll tell you it’s too late to become a web designer and instead we should prepare to bow to our AI-powered robot overlords. Instead, I’m going to share a simple 5-step process with you. This process will get you prepped and ready to start your own web design business in no time at all. That is, if you actually follow the process to a T.
The truth is that the barrier to entry for web designers has never been easier. The web design process has been dramatically streamlined with the rise of drag-and-drop website builders. At this point there are literally dozens of website builders available to you. For the purpose of simplicity, we’re going to limit our options to the 8 most commonly used website builders. Keep in mind that nearly all of these website builders have a free trial version. So try them all out and figure out which one makes the most sense for you. There are no wrong choices here. It just comes down to personal preference. I’ve ranked these in no particular order, but I will share my personal opinion of each one as we chug along here. Let’s dig in! I have a soft spot in my heart for Weebly. They’re a big reason why I now have a successful web design business today. I was right where you are now when I first started out on my web design journey. I knew nothing about coding, programming, servers and nonsense. I didn’t even know anything about the fundamentals of web design. Things like user experience, performance optimization and clear calls to action were foreign to me. But I knew small business owners were desperate to get online fast and affordably. Weebly gave me the tools I needed to learn the basics of web design without worrying about all of the technical stuff. I used Weebly to start from zero, working my way up to dozens of clients built and hosted on their platform. Eventually, as my knowledge, experience and skills improved, I outgrew Weebly and transitioned to WordPress + Elementor. But if you’re a complete newb like I was, Weebly is a great place to start your web design journey. With regards to their product, from the limited experience I have with it, it works just fine. My main issue with Wix is their apparent performance issues. Many websites I’ve seen built with it don’t seem to load very quickly. Of course, that may not be an issue with Wix itself, but rather the people who built it. Don’t blame the tool, blame the man wielding it, as they say. Another big concern is the fact that you can’t seem to change themes once you’ve begun building the site. If you choose to change the theme, it resets everything, forcing you to rebuild from scratch. That’s a problem for me. Surely you already know all about these guys. They’re everywhere. Podcasts, YouTubers, blogs, billboards, TV, radio, in your shower… Wherever you are, Squarespace will find you. I personally find Squarespace to have a very limited and boring aesthetic with their website templates. It actually drives me crazy. They market themselves as the be-all, end-all of website builders for all types, but most of the examples on their website never stray far from the hipster-fashionista-Instagram-influencer vibe. But, they do have Idris Elba in their corner so… I’M SOLD. If you’re doing e-commerce, Shopify are the guys for you. They have mastered the art of selling things everywhere. And not just your website either. Shopify will help your clients sell their products on their website, blog, social media, chat bots, retail stores, and more. Shopify easily integrates with myriads of apps and platforms, making things like shipping, payment processing and order fulfillment a breeze. They also have a robust partner platform with multiple channels for web designers to build their business off of. If your main clientele will be e-commerce businesses, you simply cannot ignore Shopify. WordPress is the king of websites. So much so that over 30% of all websites are run on WordPress. WordPress can be whatever you want it to be. It is a fully functional CMS with an endless array of plugins to customize your website to your exact needs. That, of course, comes with some increased complexity. But if you can master WordPress, your opportunities for running a successful web design business will expand drastically. In addition, there are a handful of CMS plugins that make building websites with WordPress easier and more fun. Let’s take a look at these options. Elementor was a game-changer for WordPress designers. And the web design industry as a whole. Never in my life have I seen a product that makes designing gorgeous websites so easy and so stinking fun. And at such a ridiculously affordable price. If it’s not obvious yet, WordPress + Elementor is what I use to build all of my website these days. I love Elementor with everything in my being. And the developers continue to make it better every month with new releases and updates. They have a free version, so you have no excuse not to try it out for yourself and see what I’m talking about. I’ve never used Beaver Builder before, but I hear good things about it. And what I particularly love about it is that it’s tiny. Beaver Builder is made up of 3 guys just doing something they love. I strongly identify with that. You could argue that Beaver Builder is the OG Elementor. It was around way before, and it’s founding principles are very similar. Elementor simply built off of Beaver Builder… and made something better. Now DIVI has been around a bit longer. Before Beaver Builder and Elementor, Divi popularized the idea of integrating a simpler CMS on top of WordPress. But some would argue that Divi has become a bit of a dinosaur in this day and age. Over time, it has slowly become bloated with unnecessary “features” and integrations. However, the big players always have their fair share of detractors and haters. Divi is still one of the most popular CMS in the world, so don’t write it off too quickly. So you’ve picked your go-to website builder. Now, it’s time to learn everything and anything about it. Blogs, YouTubers, podcasts, books, courses and much more are all available for your consumption. Much of it for free. It’s time to lock yourself in your mom’s basement and get to nerding. The web design industry is ultra-competitive. It’s gonna be very difficult for you to stand out from the pack and carve your own piece of the pie. One of the most tried-and-true marketing strategies is to identify a low-competition web design niche, then make yourself the expert of said niche. It’s not enough to simply tell people that you make beautiful websites. Millions of web designers do the exact same thing. It’s time to get those creative juices flowing! And from here you can niche down even further. For example, why stop at building websites for bloggers? Why not build websites for personal finance bloggers? Do you build websites for restaurants? Or do you build websites for Chinese restaurants? Websites for social media influencers? Or websites for Instagram influencers? Nicheing down will help you target ultra-specific audiences and rank higher for less competitive keywords. Remember, it doesn’t mean you have to build websites for only this one type of client for the rest of your life. Nicheing down is just a great way to get your foot in the door and build a solid foundation from which to springboard to your next niche in the future. And you can mix and match your niche as well. Combining character niches with industry niches to create a hyper-targeted call to action is great fun! Simple, lightweight web design for Mexican restaurants. Powerful, minimalist web design for tech startups. Mobile-focused web design for yoga studios. You’ve picked your favorite website builder, consumed all of the content you could find about that builder, and chosen a specific niche for your web design business. When someone decides they want to learn how to play the guitar, they don’t expect to become Jimi Hendrix overnight. So why is that so many wannabe web designers are so impatient? Learning web design is the exact same as learning anything else. It takes time, patience, commitment and consistent practice. Fortunately, it doesn’t have to take anywhere close to 10,000 hours to master web design. Thanks to many of the tools and resources we looked at before. One of the simplest ways to get in some good practice, and possibly even make a few bucks, is to use Google Maps to find website clients. Get on Google Maps and pull up your neighborhood. Then find all of the restaurants, dental offices, retail stores, nail salons, and barbershops and check out their profiles. If their site is garbage, pull as much of the content from it as you can, then rebuild it for them. No, I’m not kidding. Then, once you’re done, email them with a link to their brand-spanking-new website, and ask for their feedback. If they love it, sell it to them. By using this method, you’ll be able to gain tons of value experience building websites for your specific niche. Eventually, you’ll streamline your process to the point where you’ll be able to build an entire new site in just a few hours. This is the part most of you are gonna hate the most. I know I do. It’s one thing to have the skills and expertise, but being able to convince others that you have them is an entirely different challenge. I know so many skilled and experienced web designers that are struggling to find work. Think about it. There are millions of web designers for your customers to choose from. Why should they choose you? Why should they work with you? What do you bring to the table? Who are you? You might think you’re boring. That you don’t have an interesting story to tell. You’re not. And you do. Telling a compelling story and integrating it into your brand is one of the most important ways to differentiate yourself from your competition. Give some real thought to your brand. What story do you want to tell? The hardest part about starting a web design business is getting those first few clients. As it turns out, people are rather apprehensive about hiring web designers who have zero proof of their skills and abilities. Go figure. Getting web design clients when you have no portfolio will be your biggest challenge. The good news is, it only gets easier from there. The truth is, you will likely need to do some work for free, or at a steep discount. This takes all the risk out of hiring a brand new web designer. Trust me, there is a lot of value in all of that. So don’t balk too quickly at the idea of working for free in order to build up that portfolio. It’s a super-simple plan. The rest of it just takes hard work and commitment. Nothing is going to happen if you spend every evening watching 5 hours of Netflix and refreshing your Instagram feed. I don’t want to hear any excuses, K? Frequently asked questions I receive about learning web design. Hmm, I guess you weren’t really paying attention eh? Follow this 5-step plan: 1) Choose your favorite website builder. 2) Consume all of the blogs and YouTube channels you can find about that website builder. 3) Pick a niche for your web design business. 4) Practice, practice, practice. 5) Sell yourself as an expert in your niche/website builder. How long does it take to learn web design? That all depends on you, and how committed you are to learning it. If you learn web design as a side hustle, like I did, it will likely take you about a year before you start getting your first clients. But you can always do it faster if you’re persistent, or slower if you’re lazy! How can I learn web design for free? All of the information you need is readily available for free. Google and YouTube are your BFFs. Do the research, practice, then get to work on the 5-step plan we just talked about! I just wanted to let you know that your blogs (and your website) are seriously AWESOME. I am just starting to learn web design, and I have already found such great information here. I just wanted to say THANK YOU and I hope you keep it up, because it is very much appreciated!